I admit it, I am spoiled. So many people don’t get to travel. So many people don’t take the time to travel. So many people can’t afford to travel. So many people are too afraid to travel. The list is endless, some are very legitimate reasons others are less so, but if you can go and experience a place very different than where you are from, it is impossible to look at the world with the same eyes. If you dream of going someplace, get your passport today (if you don’t already have one). Start saving! GO! This photo was taken aboard a Qatar Airbus A380 where I recently took two trips (BKK-DOH, DOH-CDG) in First Class. I am going to call it Doha, Qatar, but really its somewhere over the Middle East. 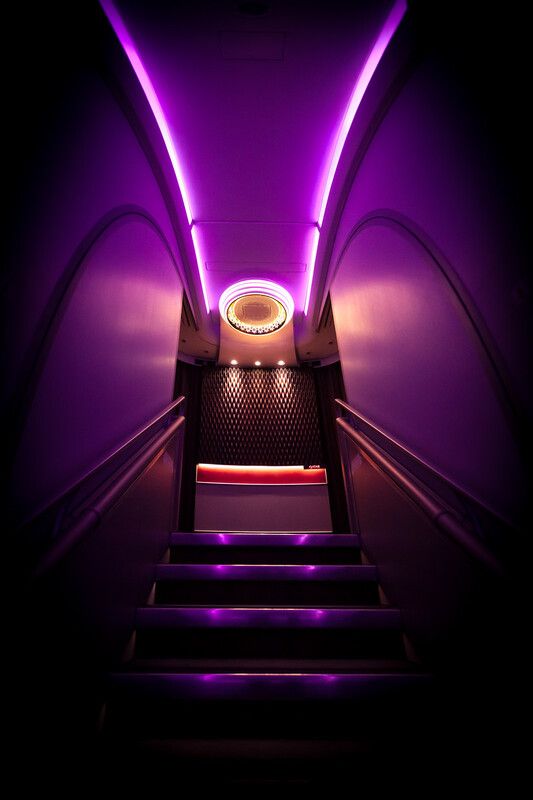 This is the stairs leading into the first class cabin from the lower deck. I told you I was spoiled!